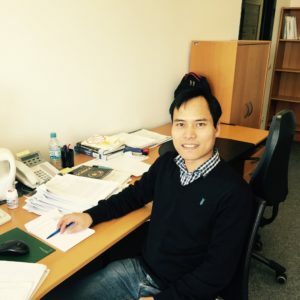 Dr. Huynh Van Luong (Vietnam) is involved in research related to the field of image and video coding and processing. 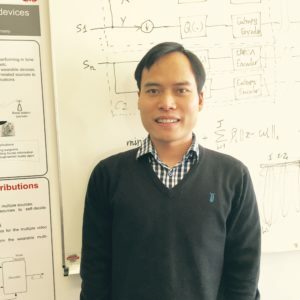 During his PhD research in Denmark, he developed a distributed video codec which requires a low encoding complexity as a solution for emerging applications such as visual sensor surveillance networks and video sensors for medical applications. Before that he developed some parallel approaches to medical image processing using a massively parallel processor array with high performance and energy efficiency. As a Humboldt Fellow at the Chair of Multimedia Communications and Signal Processing (FAU), he is developing a distributed sensing framework to deal with high-dimensional data for multi-view object recognition and tracking toward mobile augmented reality. FAU is a creative and innovative place, which creates potential for our future research collaborations. Could you give us a short description of your field of research? My research covers theoretical foundations to emerging applications in multimedia signal analysis and communications. Some of the main applications are image and video processing and communications for distributed visual sensors and smart tiny camera systems in interactive wireless environments. I am curious about how visual signals can answer questions of how we see the world and how visual signals are formulated, digitalized, transformed, and communicated. My first reason is that the chair that I am working with has interesting research areas that are well matched with my current research interest. The second reason is that FAU is a creative and innovative place, which creates potential for our future research collaborations. At FAU, this field in signal processing and communications has a strong international reputation. One of the most well-known achievements is the MP3 standard and our group contributes actively to video standards including MPEG4/H.264 and HEVC, as well as video transmission and analysis. The main differences compared to my previous university are diverse research topics, good infrastructures, and close collaboration with industry. Our research group is working on diverse topics from signal processing to multimedia communications. In particular, my project is about how to extract, transmit, and reconstruct video signal from multiple distributed tiny devices. What is your main task within your research group/your project? I am in charge of conducting my own project collaborating with my research group in Erlangen which was supported by a research fellowship from the Alexander von Humboldt Foundation. We have developed an efficient reconstruction algorithm and established its theoretical results, and applied it to multi-view object recognition for mobile augmented reality. My research is expected to develop an efficient signal processing framework for multiple visual sensors that may benefits surveillance networks, healthcare systems (such as by assisting surgeons), telemedicine, and vision systems for self-driving cars. My first impression was that it is a green, well-structured, bicycle-friendly region. My later impression was of helpful, international people and a unique culture. My particularly moment is the Bergkirchweih in Erlangen, which is a great time to not only taste beer but also enjoy the atmosphere and get inspired by Erlangen’s unique culture. My favourite place is the Botanical Garden in Erlangen, where I feel close to nature.